Eric Schmidt and Jared Cohen, authors of The New Digital Age, in conversation with Robert Wright. 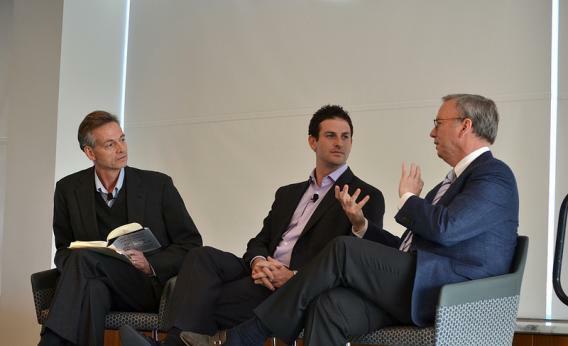 Robert Wright (left) speaks with Jared Cohen (center) and Eric Schmidt (right) about their book The New Digital Age. Photo by Nick McClellan/New America Foundation. Google Executive Chairman Eric Schmidt is ready for a future where his smart mattress monitors sleep patterns and alerts the curtains to allow daylight in, waking him at the exact right moment in his REM cycle. Journalist Robert Wright doesn’t think that sounds so great. “I would go for dream interruption myself … and maybe that’s why you’re rich and I’m not,” Wright joked. “My dreams were not interrupted and yours were,” Schmidt replied to audience laughter. Wright was skeptical about the authors’ description of our future morning wakeup routine—complete with a holographic news display, automatic suit retrieval, and that REM monitoring mattress. Will people really want to use all of that? Wright asked the authors. Everything we describe is either in development, or available now, Schmidt told him. Consumers and markets will decide which gadgets and fixes are essential. Though Schmidt and Cohen are optimistic about the good that “wiring the world” will unleash, the book offered plenty of sober analysis about the way technology could introduce new societal perils—like grid vulnerabilities, cyberwar, and online persecution. During Thursday’s conversation, Wright and the authors mapped out the digital challenges of the future and explored how we should respond to the tech-related trials of today. One seemingly intractable problem that could benefit from technology: the radicalization of young people—both in the United States and abroad. Cohen suggested that smart phones and Internet connectivity could discourage disaffected youth from turning to terrorism by “planting a seed of doubt”—exposing them to different perspectives and arguments against radical ideologies. Again, Wright was skeptical. Isn’t conventional wisdom that the Internet has constructed a society of entrenched silos—a collection of echo chambers? But what happens when “learning new things” means discovering controversial parts of American foreign policy—like drone strike casualties? Wright asked the authors whether they thought “blowback from American foreign policy is, for technological reasons, a bigger risk than it used to be“ because people all over the world can now access more information, and bad actors can more easily mobilize aggrieved populations. According journalist Glenn Greenwald, many homegrown terrorists—like the Boston bombing suspect Dzhokhar Tsarnaev—cite U.S. foreign policy as motivation. While the cocktail of technology and American foreign policy may not cause more terrorism, the combination of digital connectivity and persecuted populations can accelerate other political movements—like the revolutions of the Arab Spring. But tech can only smooth the way up to a point. It’s easier to start revolutions, but harder to finish them, Schmidt said. “It takes decades for people to develop leadership skills to run a country.” And post-revolution, the population has elevated expectations for what its new leaders will be capable of. Still, as more countries connect to the Internet, there may not be as great a need for massive uprisings. Online populations pose a big threat to future dictators, the authors explained: Malevolent behavior can be recorded and disseminated instantly. That doesn’t mean a leader won’t attack his people, but he “may decide it’s not worth paying the price” of international disparagement and law enforcement. The fact that things are being recorded will make dictators less deadly, Schmidt said. But transparency can’t protect us against one of the biggest risks of the digital age: cyberwar. “In the virtual world, locating the origin of cyberattacks is hard,” Wright pointed out. That’s because a slippery proxy setup can pin an attack on the wrong nation. For example, Russia could attack us, but make it seem like the perpetrator was China. But according to Schmidt and Cohen, the “nightmare scenario” is when a digital attack “leaks” into our physical world—like the impact of an assault on our grid. No conversation with Google big-wigs could be complete without a reference to a futuristic scenario that’s playing out in certain parts of the country: Last month, the company released Google Glass to a select group of developers, igniting a media storm of criticism and wonderment. Denied. Schmidt and Cohen cautioned against censuring the glass until it’s more widely disseminated—and we can see how people really use it. Right now, glass is in the hands of a few thousand developers. “We want them to build applications. … The sum of all of that will guide what we do, how we build the product forward,” Schmidt said.